Have you ever experienced closing your eyes in the middle of a meal as you savor your food with your five senses on full blast? Like you were in a trance-like state for a few seconds? Have you ever dreamt of a particular dish and wish you could eat it again asap? Have you travelled for hours just to get a taste of a certain dish even if you’ll be stuck in traffic going home? Because I have. Many times. 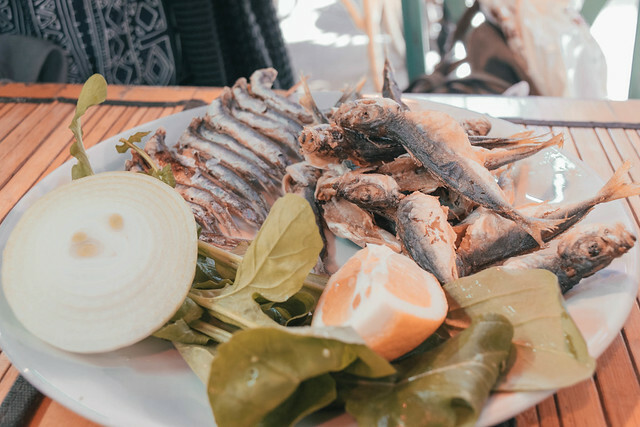 When I joined the Culinary Backstreets Two Markets, Two Continents food tour three months ago, our tour guide Gonca (pronounced Gon-ja in Turkish) told me something like this, “Maria, you’re a foodie. Every time I let you try something, you’re very eager and curious. When you eat the food, you let your senses control you as if you’re making love with it.” Maybe she was right. I am a foodie and I never realized that until that sunny spring day in Istanbul. I don’t know if I’m worthy of being called a foodie yet; all I know is that I love food. 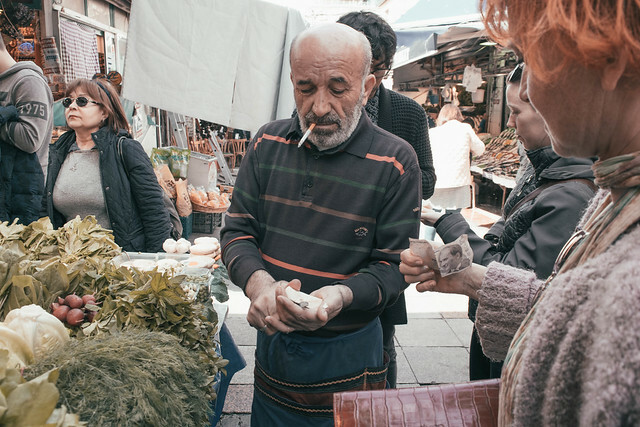 So without further ado, here's the recap of the Two Markets, Two Continents tour which led us around Istanbul neighborhoods I otherwise might not have visited. 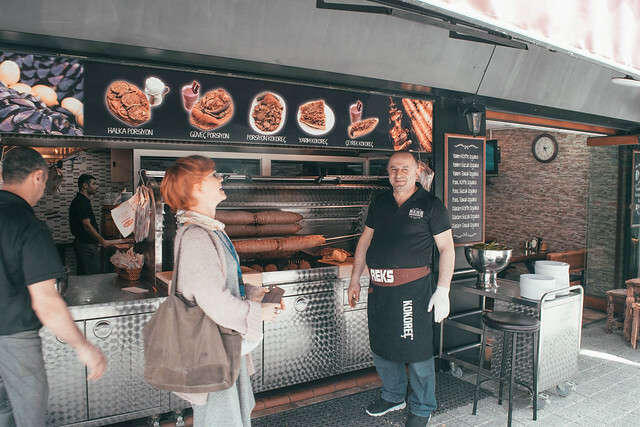 You’ll get a sense of what this tour has to offer, but really, join the Culinary Backstreets tour if you’re visiting Istanbul anytime soon. I’d do another one in a heartbeat. The meeting point was the kiosk shop adjacent to the Galata Bridge in Karaköy at 9:00 AM. We were 30 minutes early because we completely forgotten that Istanbul’s transportation system was reliable unlike Manila’s. 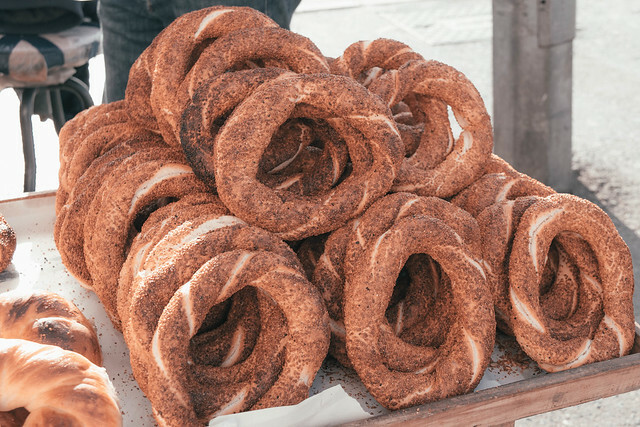 We were there at the bridge contented of watching Karaköy came to life, observing how locals set up their gears for fishing, how simit vendors set up their stalls and how Turkish tea vendors came out of nowhere. It was organised chaos. It wasn’t long until our tour guide, Gonca, appeared. On our way to our first destination, she explained the simit system in Istanbul. 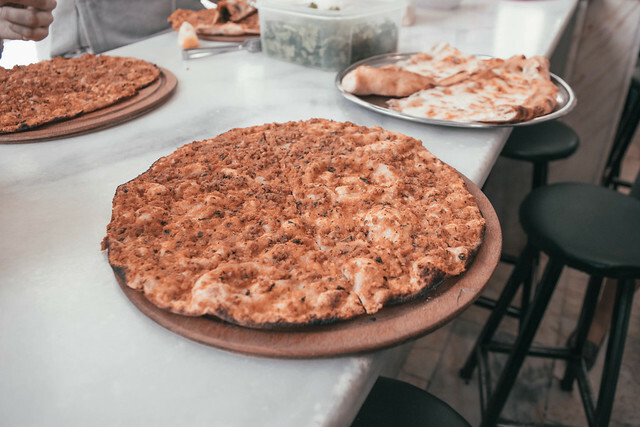 According to her, this iconic circular sesame-crusted bread was the only food that must be eaten on the go. Many locals on the run take advantage of simit vendors who normally start early in the morning and each of them have their own ‘simit guy.’ It’s actually like the suki system in the Philippines whereby a customer regularly purchases products or services from the same provider in exchange for favourable treatment. 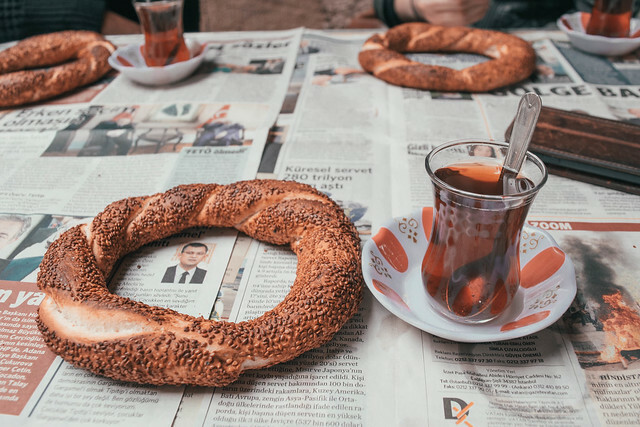 Gonca said every simit guy in Istanbul has their own territory, which was regulated by the government. I was actually under the impression that simit guys go around the city to sell simit because their stalls have wheels. 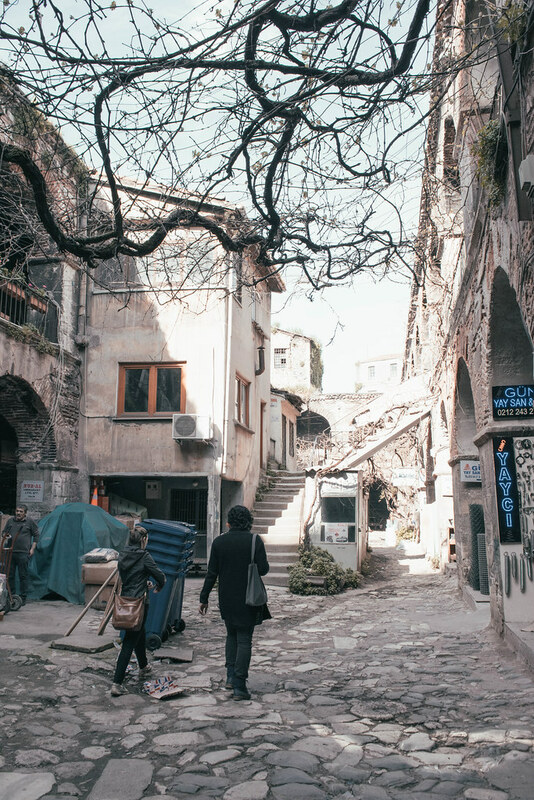 The Perşembe Pazarı has been a hardware-supplying neighborhood in Istanbul for years. But before that, it was a commerical port who caters to sailors and traders. 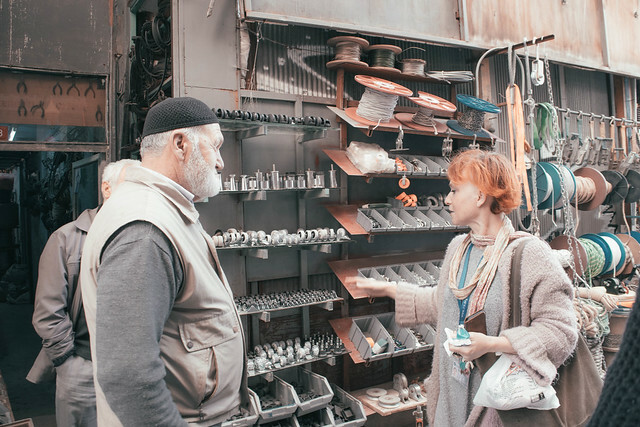 We explored the Perşembe Pazarı for a few minutes as Gonca explained that the area has been a hardware-supplying neighborhood for the past 30 years. But before that, it was a bustling commercial port then a charming banking capital. Then, we have reached a lovely little lokantasi run by a husband-and-wife team where I had one of the best breakfasts I’ve ever had in my life. 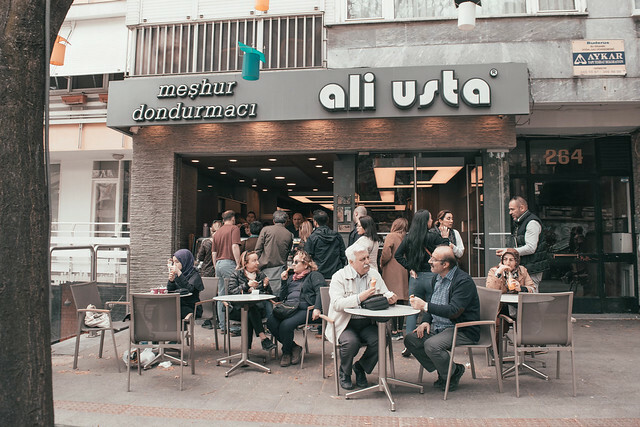 This local restaurant serves a simple menu at reasonable prices and its unassuming facade conceals the best Turkish breakfast. This is where our tour guide explained that Turkish breakfast is not just a necessity but rather a family gathering. As we all took our seats, Gonca introduced us to the owner and his son. 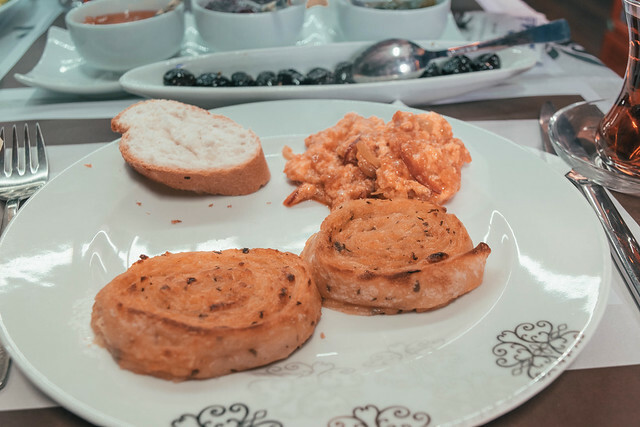 Before I knew it, our tiny table was already full of aesthetically pleasing plates with freshly baked bread, best quality olives and cheeses, a selection of homemade jams and marmalades, cold cuts, Turkish tea, honey and Kaymak. 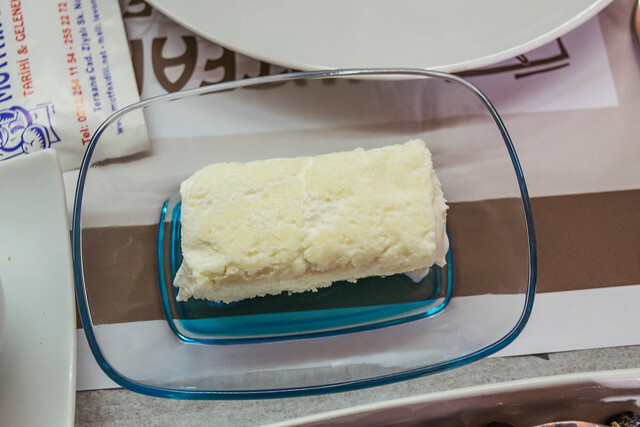 The highlight of the Turkish breakfast, for me, was the piece of gourmet heaven called Kaymak. 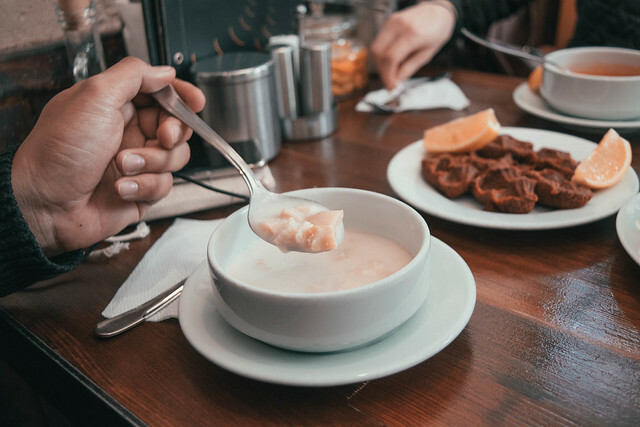 This Turkish version of clotted cream is a breakfast essential and is perfect when eaten with honey and a crusty bread. Seriously, I would do anything to get a taste of it again! I would do anything for you, Kaymak! In just 10 minutes, I finished everything on my plate. I came prepared with an empty stomach so I could taste everything given to me, but self-control went out the window when I asked for another serving of Kaymak with honey and bread. Then I finished my Turkish tea. My stomach was already full it was just the first stop! Good thing, there was a bit of a walk before the next. Gonca said the second destination will be an old Ottoman-era caravanserai where we will have our simit and tea. “Wait a minute, we’ve just had our tea!,” said my stomach. 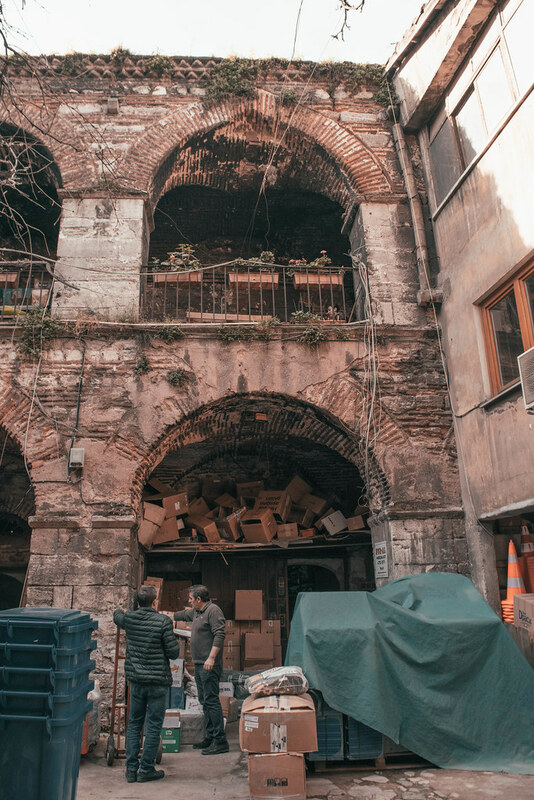 If I were walking alone in this lesser-known area of Karaköy, I would have never known that this was once a bustling caravanserai during the Ottaman empire. “How many cups of tea do you consume every day?,” I asked Gonca. She said she doesn’t really know because drinking tea is like drinking water. Like Turkish coffee, tea plays an integral part of Turkish culture. Turkish people loves tea and a conversation will never be complete without it. 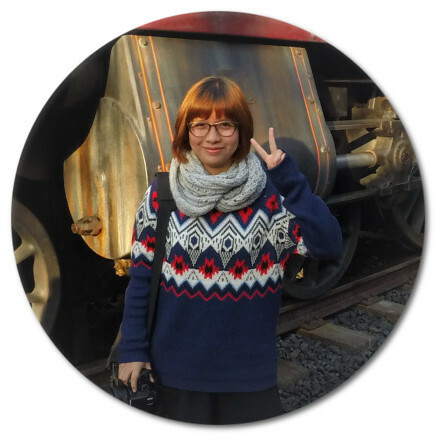 In my 11-day journey in the country, I saw everyone drinking tea. Everywhere. All the time. I wondered where did they get their hot, steaming cup of tea. The Han or Caravanserai is a roadside inn where travelers could rest after days of travelling. Gonca explained that every square inch of the city has a ‘tea guy.’ Pretty much like the ‘simit guy,’ the ‘tea guy’ has his own territory. Oftentimes, their stalls are tucked almost out of sight, which will make first time visitors wonder where the locals get their tea. You’ll see locals sitting on tiny stools then a ‘tea guy’ brings their tea. Our tour guide said there won’t be cash payments on each transaction because locals would pre-pay for their tea. For example, you pay the ‘tea guy’ a hundred lira and you get a hundred chips in return. Each time you order a tea from him, he will get 1 chip back from you. I asked Gonca, “What if the ‘tea guy’ never shows up again?.” She said that won’t happen because he is your ‘tea guy’ and he would never betray you. Seriously. This suki arrangement was on another level! While we were on Karaköy’s 16th-century Kurşunlu Han building, we were served a fresh cup of black tea made by a tea master. Gonca said it was a great tea, and when you drink tea every day, you end up being particular about your tea. And when you have a trusted ‘tea guy,’ he will know what sort of tea you like. 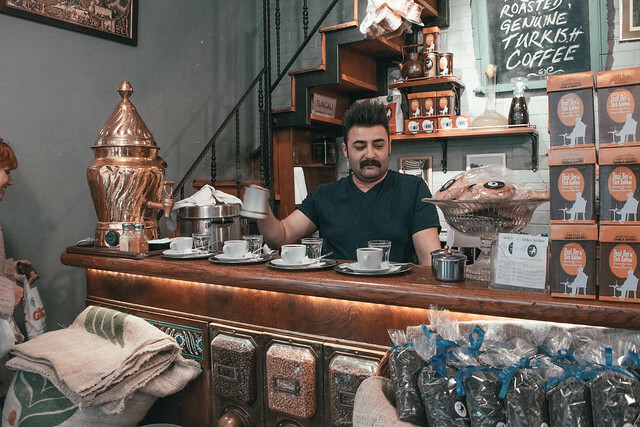 This concept ‘tea guy’ in Istanbul is really something, no? While I reminded myself to fight the temptation of eating too much, I won’t say no to desserts! It was not just a regular dessert but a Turkish dessert. Nobody says no to Turkish dessert. Right? So when Gonca asked if we want some chocolates and Baklava, nobody in the tour group said no. 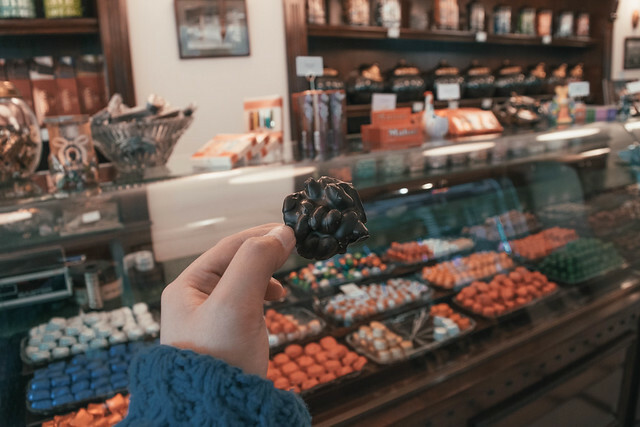 We first went to an old chocolate shop where I had one of the best dark chocolates I’ve tasted so far. 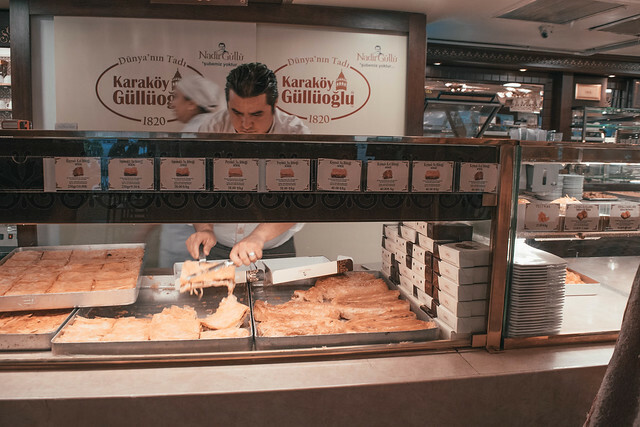 Then, we stopped at Karaköy Güllüoğlu, a famous baklava shop. 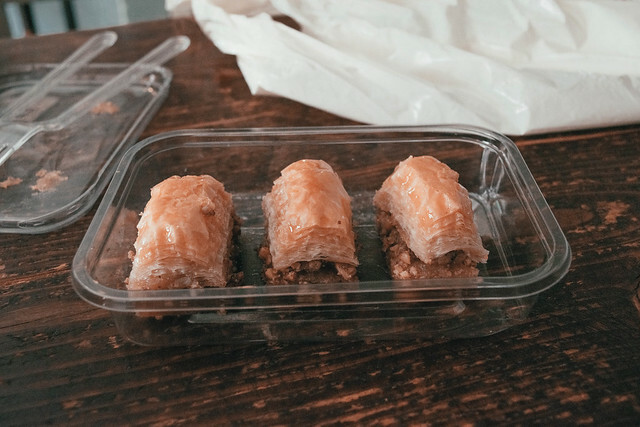 Our tour guide bought a few delicious looking baklava for the group, and I would have eaten it right then and there if she had not put it in her bag. Haha! Get a hold of yourself. At the Karaköy Güllüoğlu, you get to choose whatever takes your fancy then pay at the register. 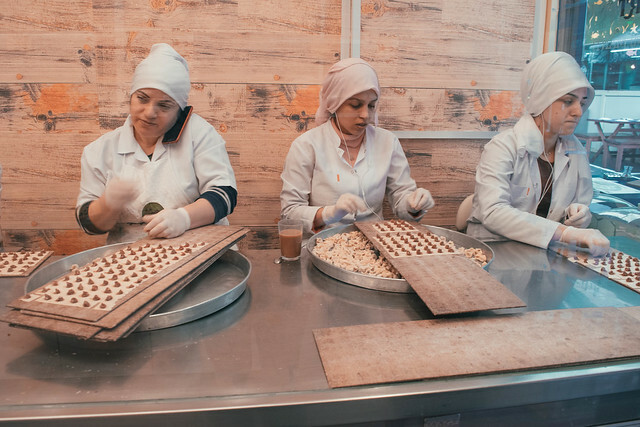 They serve the best-tasting Baklava in Istanbul and they also serve great borek (baked filled pastries). 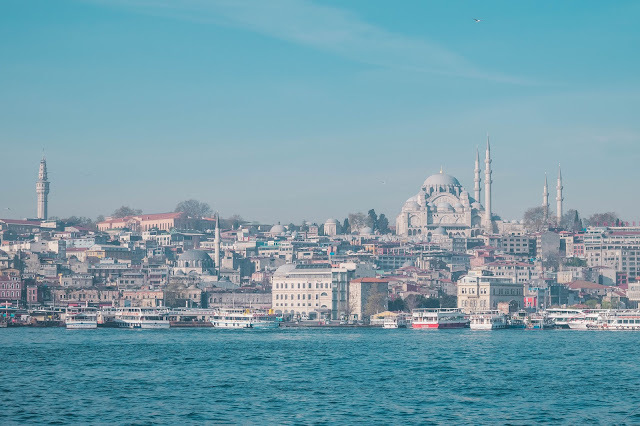 Then we hopped on a local ferry and crossed the Bosphorus Strait to get to Kadıköy on the Asian side, which holds the highest concentration of traditional food shops and eateries in Istanbul. 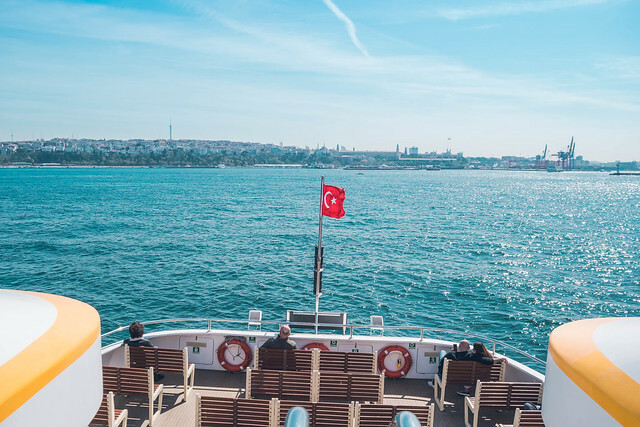 While on the ferry, Gonna gave us the borek she bought from Karaköy Güllüoğlu. It was light and tasty but I held back from eating more because I knew there were so much more to try once we get off the ferry. Crossing the Bosphorus Strait was included in my bucket list and I finally crossed it out! 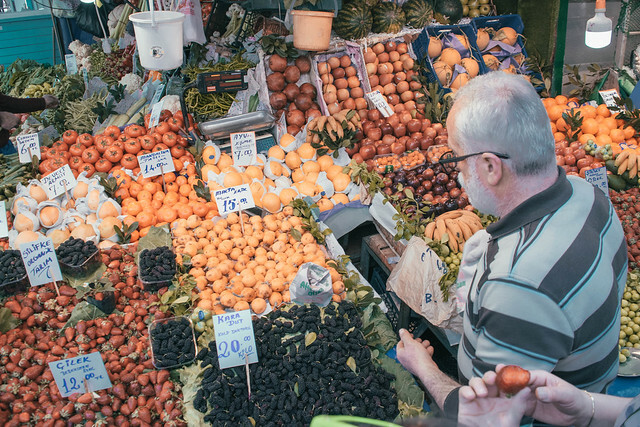 We were welcomed by a plethora of sights, sounds and flavours at the Kadıköy Produce Market. This behind-the-scenes tour allowed us to see where the ingredients used in a delicious Turkish meal were sourced. Gonca told us where she gets her fresh fruits and vegetables, fish and other seafoods, meze, cheese and olives etc. We were greeted by many friendly local merchants as we went around. It did not feel like we were touring the market but it was like meeting a friend while you’re doing shopping. 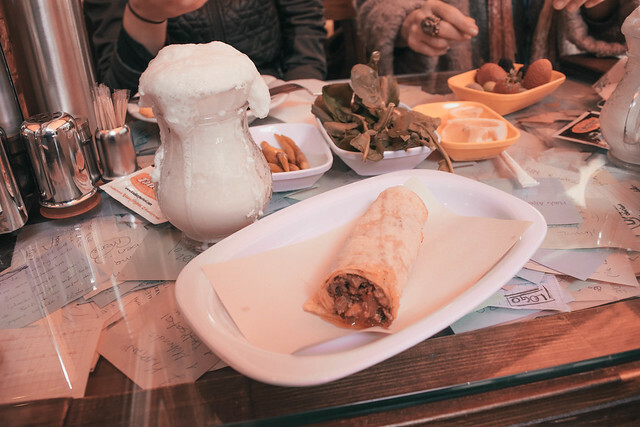 At each quick stop, we get to try anything we fancy and at the same time we get to know more about Istanbul. 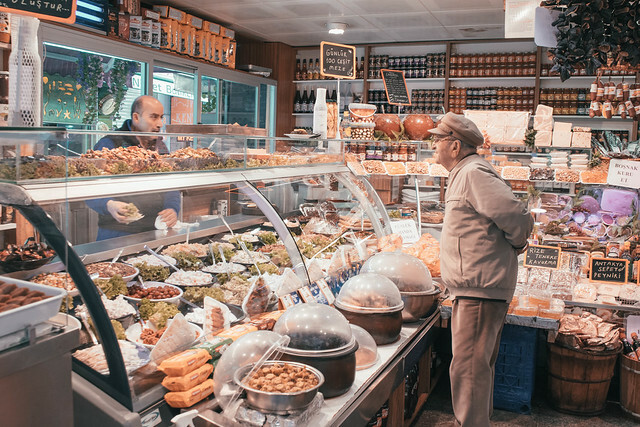 After our fish market tour, we went to this restaurant, with a few refrigerated glass display cabinet filled with a selection of mezes, in the middle of the bustling market. There were many options which all looked fresh and enticing so I would really have a hard time choosing what to try if I was doing the food tour on my own. Thankfully, we had Gonca with us. We feasted on a platter of meze (Turkish appetizers) while she explained what sort of vegetables are used for mezes and how Turkish prepare them. *Mezes are traditional Turkish appetizers which are served on the table together with a basket of bread before the main course. Turkish coffee is famed for the way it is made and its unique taste. Gonca told us interesting facts about the Turkish Coffee and how it should be consumed. 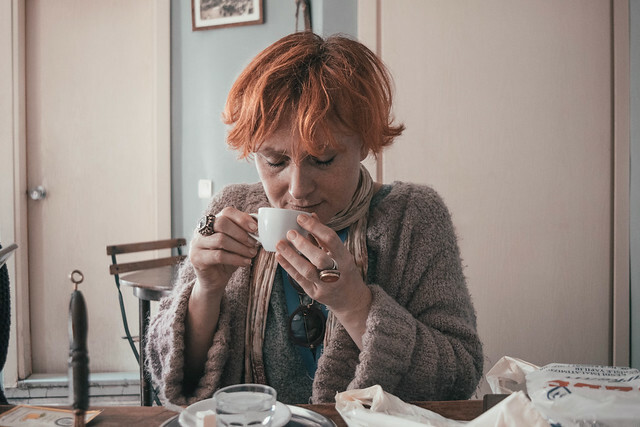 We have learned that there’s no such thing as Turkish coffee beans because it really doesn't matter what kind of coffee you use as long as you know the proper way of making it. 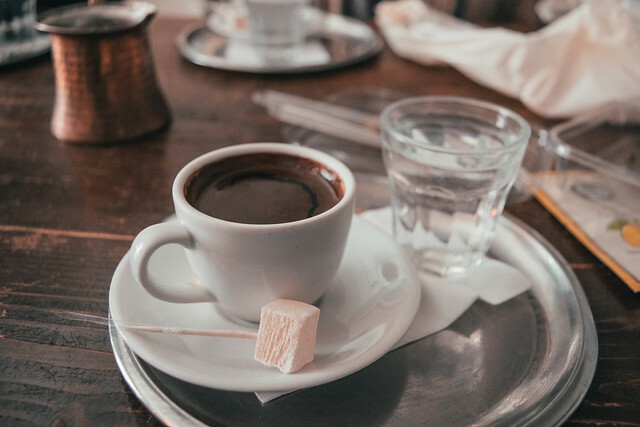 Unlike your typical Starbucks coffee, Turkish Coffee is not the kind of a beverage you just grab and go. It forces you to sit down and savor the flavours slowly. I was actually hesitant to try this because it looked so strong but when I did, I really loved it! 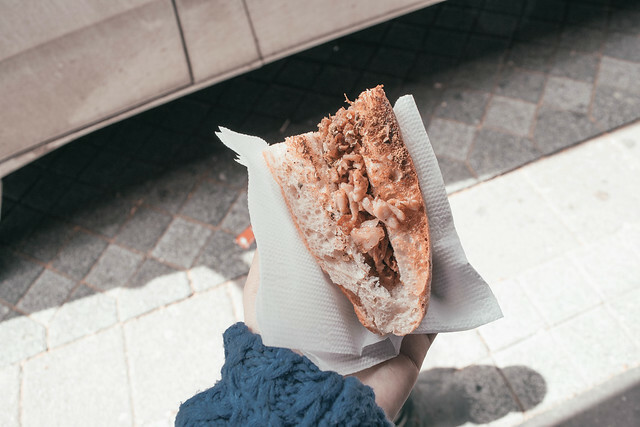 Eating street food is one of those travel experiences I would never miss. Every since I started travelling, I always make sure to eat at least one popular street food in the city I’m visiting. And I was so glad the Culinary Backstreets Two Markets, Two Continents tour included a few stops for street food at Kadıköy’s local eateries. 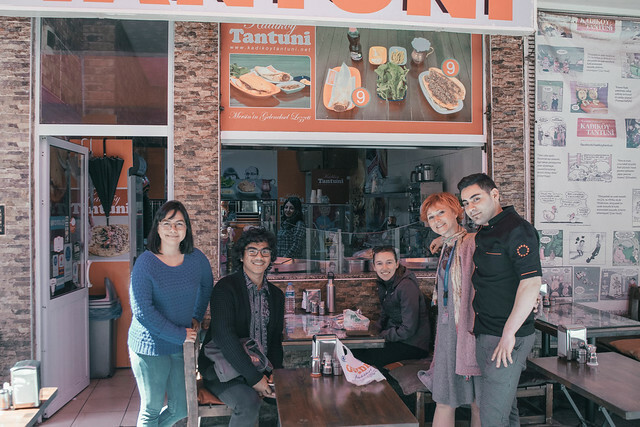 After our Turkish Coffee experience, we got to try spiced tantuni at Kadıköy Tantuni. 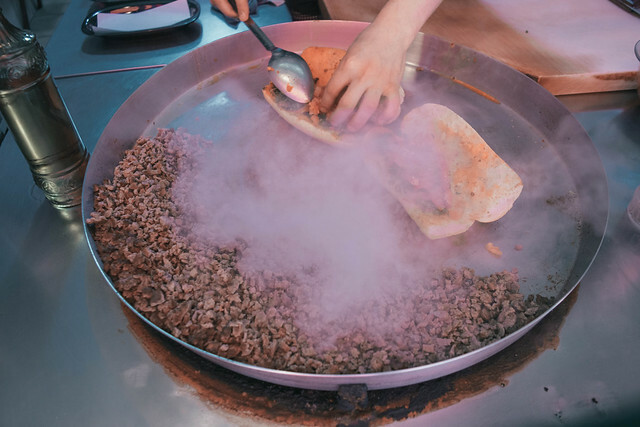 This popular street food is made from stir-fried beef or lamb with spices, parsley, onion and tomato wrapped in a soft, fresh slice of lavash flatbread. I would say it was Turkey’s answer to Mexican Tacos. Although I was already full, I finished my tantuni because it was so good! I would definitely eat this again when I go back to Istanbul. seriously guys, this Kokoreç sandwich is the bomb! When the tempting question “Should we get dessert?’"comes around, it's always a yes. 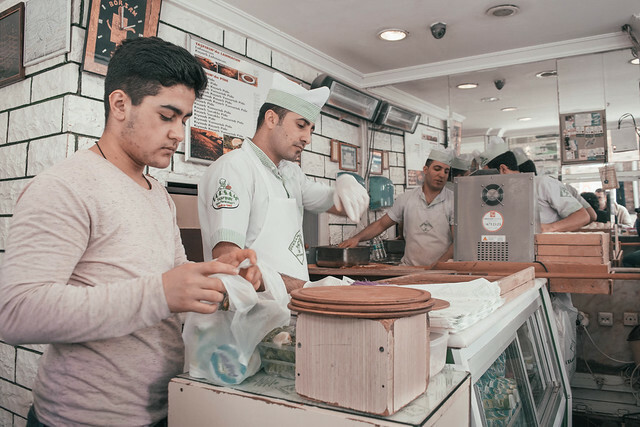 So when Gonca asked if we want some ice cream, not just any other ice cream but Istanbul’s best ice cream, we were sold! I tried the goat milk ice cream which was smooth, light and creamy. It was definitely the best way to cap off Culinary Backstreets Two Markets, Two Continents tour. 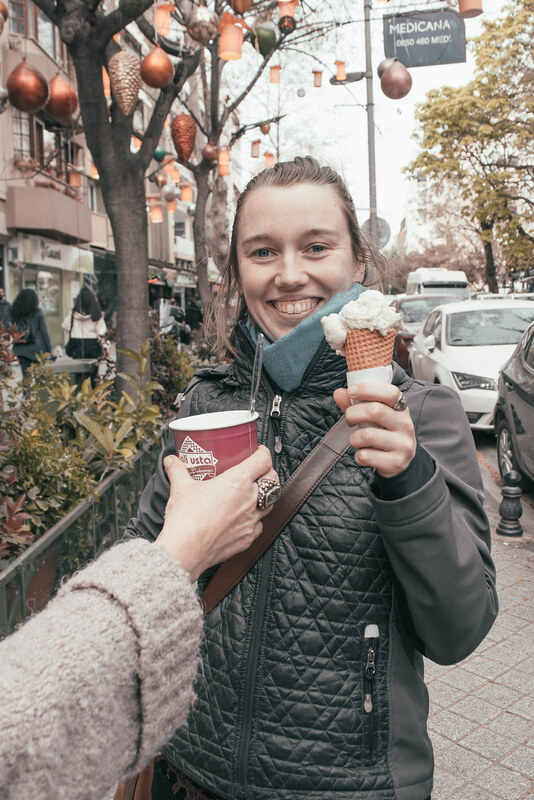 there's no better way to end the food tour than a yummy ice cream! In Filipino, I would say that Culinary Backstreets Two Markets, Two Continents tour was sulit na sulit! It was so much more than just a food tour but also an outstanding overview of Istanbul’s culture and history. 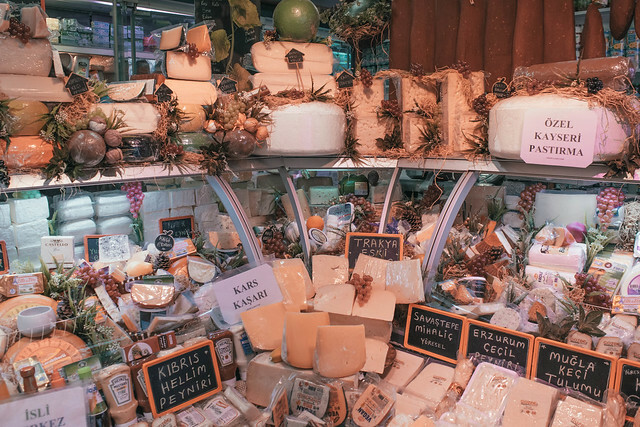 Each food tastings at the best specialty food shops and local restaurants in the culinary backstreets made me feel like I knew more about the city and Turkey in general. Our tour guide, Gonca, was excellent and every time a merchant greeted her as we walked by, it truly felt like we were guided by a true local. If you can only do one tour in Istanbul, I would highly recommend this one. The company, Culinary Backstreets, started in 2009 by Ansel Mullins and Yigal Schleifer as a humble food blog called Istanbul Eats. 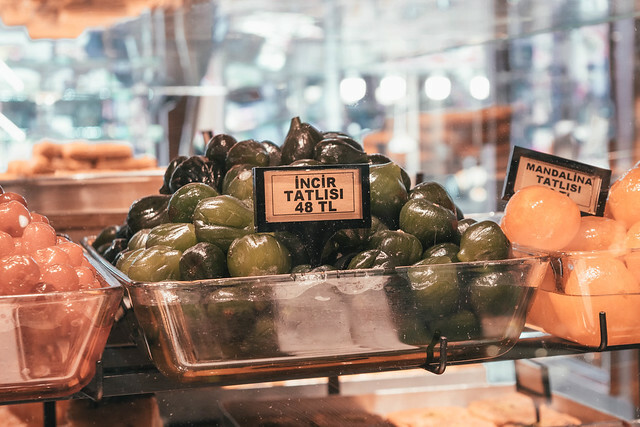 The blog is devoted to collecting the best undiscovered local eateries in Istanbul you might not always find on your own. 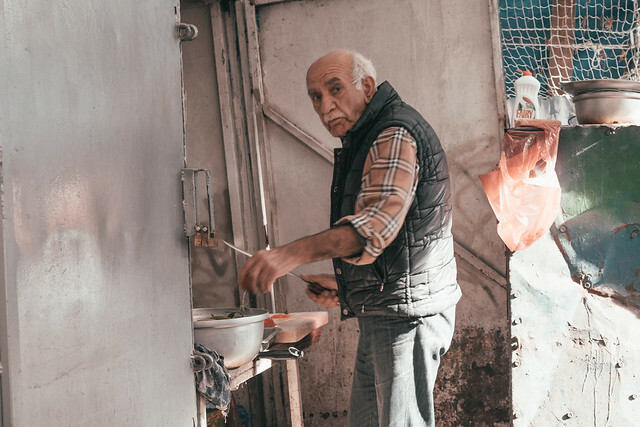 They wanted to tell the stories of small, traditional eateries that are often overlooked and the unsung heroes of Istanbul's culinary scene. The following year, they launched a book of their food reviews and their first culinary walk in Istanbul. 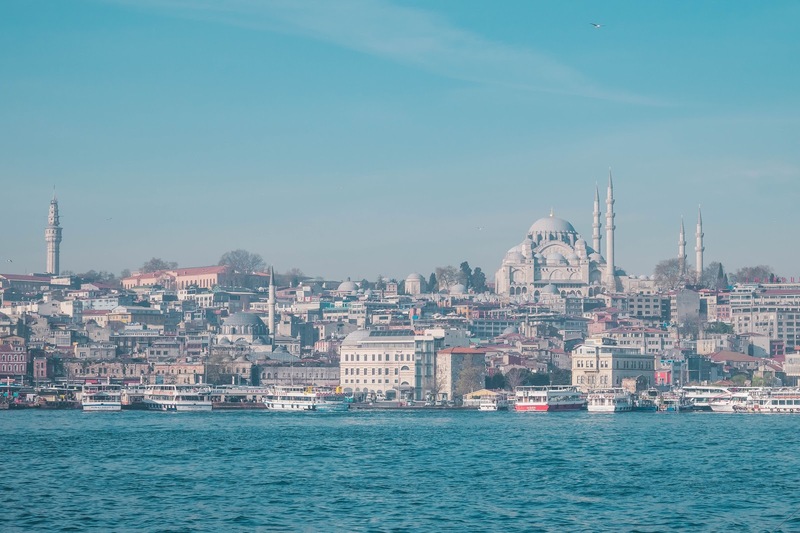 Today, Culinary Backstreets is one of the top food tour operators in Istanbul and they have since expanded to Athens, Barcelona, Rio de Janeiro, Shanghai, Mexico City, Tbilisi, Tokyo and Lisbon. Disclaimer: Culinary Backstreets generously provided a complimentary food tour on my trip. As always, all opinions are my own.